LAHORE: At least a hundred people including supporters of the Pashtun Tahafuz Movement (PTM), activists and civil society members on Monday held a protest rally to express resentment over the arrests and registration of cases against the workers of the movement. The protest held outside the Lahore Press Club on Pashtun Tahafuz Movement (PTM) leader Manzoor Pashteen’s call, was attended by emotionally charged individuals who chanted full-throat slogans including “Yeh jo naa-maloom hain, sab ko maloom hain (all the unknown are known to all)”. Moreover, the participants of the protest held placards, banners and pamphlets inscribed with slogans such as, “Jabri-gumshudgi ab nahi (no more enforced disappearances)”. The protesters demanded the immediate release of arrested PTM activists, withdrawal of cases, the release of all enforced detainees and missing persons. They also urged the government to stop the harassment and humiliations of Pashtuns at security check-posts and during search operations on the pretext of the war against terrorism. They also expressed strong resentment over the arrest of Arif Wazir and others in South Waziristan and the Federally Administered Tribal Areas (FATA). They said the treatment meted out to PTM members was “against the basic constitutional and human rights”. She also urged the government to review its policies towards the Pashtuns. 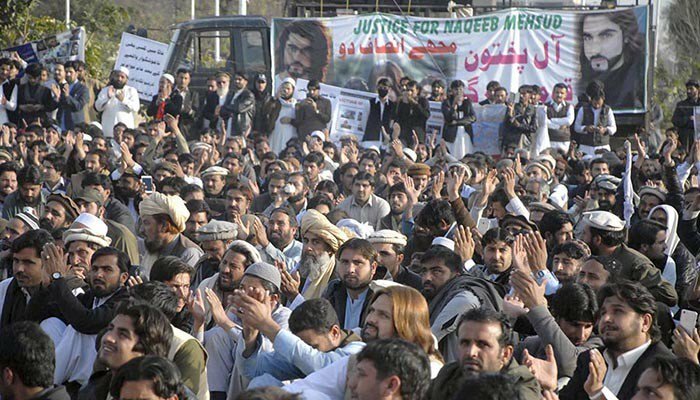 Manzoor Hussain of the People Solidarity Forum – a forum of those inclined towards the leftist school of thought – said that he along with his workers had come to express solidarity with the PTM. Pashtun activist Abrar Ahmed also participated in the rally while dressed in his lawyers’ uniform. He said that he would fight the cases of PTM members and each and every individual, under the Constitution of Pakistan, had the right to stage a peaceful rally. Muzammal Pashtun, who was the organiser of the rally, demanded the release of all PTM members and said that the FIRs registered against them in Quetta, Zhob and other areas should also be quashed. He urged the government to accept the five demands of Manzoor Pashteen, and claimed that the leaders and office bearers of different political parties would join their protest on March 31 to support the PTM’s demands. He also demanded an exemplary punishment for SSP Malir Rao Anwar involved in the Naqeebullah murder case. The participants fearing arrest dispersed peacefully a while later. They were seen asking each other to disperse at the earliest as they claimed that personnel of security agencies were chasing their protest rally.